Round wooden pill container marketing (and originally containing) Dr. Williams Pink Pills for Pale People. Containing a combination of iron oxide and Epsom salts, Dr. Williams' Pink Pills were marketed to Civil War veterans with digestive problems, malaria, wounds, and emotional disturbances. 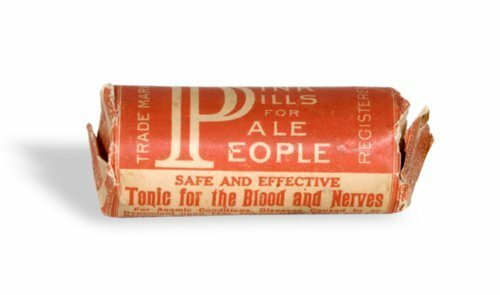 Later advertisements claimed the pills were a remedy for many female ailments and could restore the blood and nerves. They were marketed through Dr. Williams' Medicine Company (the trading arm of G. T. Fulford & Company) of Schenectady, N.Y.